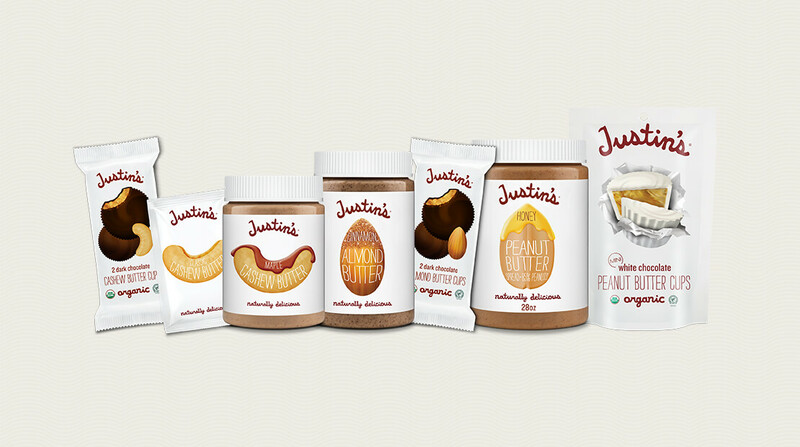 Justin’s, maker of naturally delicious, high-quality nut butters, nut butter snacks and organic peanut butter cups, today announces 11 new SKUs of great tasting products to the brand’s extensive and admired nutty family. Officially being unveiled at this year’s Natural Products Expo West and rolling out on shelves over the course of the next few months, Justin’s welcomes new firsts for the brand including a line of Cashew Butter and Dark Chocolate Almond and Cashew Butter Cups along with tasty line extensions in White Chocolate Mini’s, 28 oz. Peanut Butter and Cinnamon Almond Butter. Cashew Butter: A total game changer, on-trend and exciting add to the Justin’s brand, this is the first new nut to join the family since 2010. Introducing the first-ever natural, no-stir cashew butter providing all the tasty, convenient, on-the-go nutrition in both jars and portable squeeze packs in two of varieties – Classic and Maple! Organic Dark Chocolate Cashew Butter Cups: A new original following in the footsteps of its peanut butter counterpart, Justin’s introduces the first-ever Cashew Butter Cup in celebration of the ever-increasing need for permissible, better-for-you snacks and treats. Available in 2-cup packs. Organic Dark Chocolate Almond Butter Cups: A natural next in the pipeline given the iconic status of Almond Butter to the Justin’s brand, this new permissible indulgence brings everything you love about the brand together into the ultimate bite—Justin’s Almond Butter paired perfectly with delectable high-quality organic dark chocolate. Available in 2-cup packs. Cinnamon Almond Butter: Knowing consumers seek variety in nut butter, this new naturally delicious spread joins the infamous almond butter line up complete with Justin’s signature one-of-a-kind grind and a hint of 100% Organic Cinnamon to create a subtly sweet, perfect addition to the set. Available in jars and portable squeeze packs. Organic White Chocolate Mini Peanut Butter Cups: Shareable and portable bite-sized treats, these new, on-trend mini versions of Justin’s delicious White Chocolate 2-cup packs provide consumers with the only natural and organic white chocolate peanut butter cup offering one snackable, bite-sized cup at a time! Available in 4.7 oz stand-up pouches. 28 oz. Peanut Butter: Justin’s now also meets the need for families seeking larger quantities of peanut butter by launching the first branded, natural offering to the set in a value size, 28 oz. jar. Available in the brand’s two great tasting peanut butter varieties – Classic and Honey. When crafting these new varieties, Justin’s took extra care to ensure these products are not only great tasting, but are made with the high-quality, sustainably sourced ingredients that today’s natural consumers actively seek. All new products are Non-GMO Project Verified, use Orangutan Friendly Palm Oil and are certified gluten-free, while the confections also feature only Rainforest Alliance Certified Cocoa and are USDA-organic. Check out the brand’s innovations at Fresh Ideas Organic Market Place, Thursday March 8, booth #158 or jet on over to booth #777 at Natural Products Expo West, Anaheim Convention Center, Anaheim, CA on March 9-11 to taste the future of Justin’s for yourself. Expect to engage with fellow astro-nuts, explore the “nut sky” and share in the out of this world missions Justin’s encountered over the last year to bring a groundswell of exciting and tasty innovation to the brand portfolio. To schedule time with Justin’s at the show or for more information, please contact justins@havasformula.com. Established in 2004 in the home kitchen of health enthusiast Justin Gold, Justin’s supports an on-the-go lifestyle with an extensive line of naturally delicious, high-quality nut butters, nut butter snacks and USDA-certified organic peanut butter cups that deliver great taste, unique texture and convenient nutrition. Justin’s was the first nut butter brand to market its popular jarred offerings in single-serve 1.15 oz. squeeze packs available in all ten varieties and marketed the first organic peanut butter cup in its most nostalgic form (2-cup pack). The brand is not only dedicated to providing superior products with mindfully-sourced ingredients, but also actively engages in corporate social responsibility efforts each year, focusing on key brand passion points including pollinator preservation, hunger relief, entrepreneurship and supporting the natural products community. For more information please visit Justin’s at Justins.com, Facebook.com/JustinsNutButter and Instagram.com/Justins.